Is there a way to enable the ringer/notification sounds only when using headphones? I always keep my phone in vibration mode (no ringer, no notification sounds, just the vibration), since I'm a forgetful person and I'd end up forgetting to turn the ringer off when I'm in a meeting or other occasions when it wouldn't be appropriate. This works fine for my needs, except in one instance: when listening to music. When I listen to music I typically keep my phone in the pocket of my jacket and I end up missing all my notifications, since between the music and the fact I don't have the phone in my hand or on my desk I can't hear nor feel the vibration. 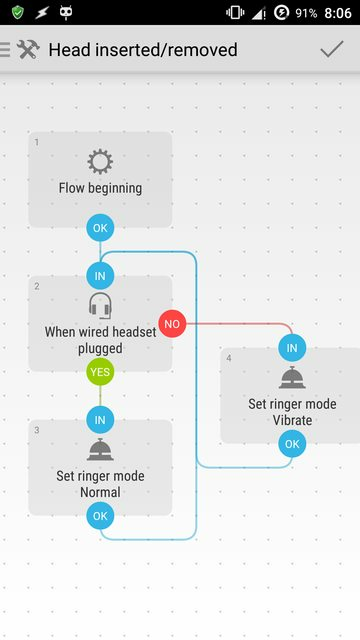 My question is: is there a way to turn the ringer/notification sound on when the headphones are connected, while keeping it off when they aren't? I don't have Android Marshmallow but following apps can easily achieve the goal on Android Lollipop 5.1. Should not fail on your OS, I believe. Let me know the result in any case. Interface → Wired headset plugged? The said flow would cause the ringer and notification volume to come back to the level you set them to, before switching the phone to vibration. It worked as well. However, it appears to not been updated since May 2015. It also worked well for me. Ensure Tasker is installed and enabled. I tested this with Tasker 4.8 on Android 6.0.1 Marshmallow. If you are using Tasker on Marshmallow, it will work more effectively if you disable battery optimisation under the Android Settings (although this may also drain the battery quicker). To do this, navigate to Battery -> Triple dot menu (in the upper-right hand corner) -> Battery optimisation. Then click on the drop-down menu and select All apps and scroll down to Tasker. Click on Tasker and press Don't optimise followed by Done. To do this, open Tasker and create a new task. Name it whatever you like. Then add an action and navigate to Audio -> Ringer Volume. Drag the slider to 7 (this is the maximum volume and you can adjust this if you want). Do the same for Audio -> Notifcation Volume under the same task. Now add a profile and navigate to State -> Hardware -> Headset Plugged. Don't change the default options here and navigate back. You will now be prompted to add a task. Select the task that you created earlier. Once ensuring that the profile is enabled, exit Tasker and set your notifcation/ringer volume to vibrate. That's it. The ringer and notification volumes should now change automatically when you plug and unplug your headphones. I'm the creator of SoundAbout. It does this in the Alert behavior / Wired headset behavior / Notifications To / "Headset only (override)"
Not the answer you're looking for? Browse other questions tagged notifications ringtone headphones or ask your own question. How to prevent brightness from going to full when the battery low popup appears? What volume setting do the Twitter and Facebook apps obey? Can (ringer) volume only be locked by hacks/apps or is there a easy way? Is there any way to enable the ringer ONLY for a particular caller/group of callers?